Another case in Russian grammar is the Genitive case. Genitive case is used in many instances and answers the question "Чей, кого, чего? " "Who, whose, of what?" Russian cases seem to be causing a lot of difficilties for learners of Russian. Whenever the problem is too big to attack at once you should approach it step by step. The nominative case you already know. So in this lesson let's learn Dative and Genitive cases. Dative case is used to indicate an object of an action and is used with verbs like подарить тебе (to give as a gift to you), объяснить тебе (to explain to you), рассказать тебе (to tell you), показать тебе (to show you), дать тебе (to give to you), написать тебе (to write to you), сообщить тебе (to inform you) and some others. Nouns in the Dative case answer the question "whom/ to whom?/ to what?" or in Russian "кому? чему?" for example : You wanna give this to whom? To my sister. Кому ты хочешь это дать? Моей сестре. You want to explain this to whom? To the Professor. Кому ты хочешь это объяснить? Профессору. Мы шли к пруду - We were heading toward the pond. Идет солдат по городу. - A soldier is walking in the city. Я приду к тебе - I'll come to you. Please note that in this case prepositions к and по are normally used. For Singular Masculine nouns change of endings goes like this: zero ending changes to -у (муж - мужу), -а/-я changes to -е (Ваня -Ване), ь changes to -ю (корабль - кораблю). For Singular Feminine nouns: -а / -я changes to -е (баня -бане), ь changes to -и (боль - боли), -ья changes to -ье (скамья - скамье) and -ия changes to -ии (партия - партии) . 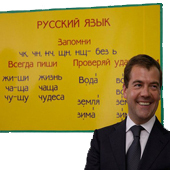 For Singular Neuter nouns: -о changes to -у (бревно-бревну), -я changes to -ени (знамя-знамени). For all Plural nouns : if the ending is soft like -ья,-ьи (колеи) и then we get -ям (колеям) ending. If the ending is hard like -а,-ы (пацаны) then we get -ам (пацанам) ending.